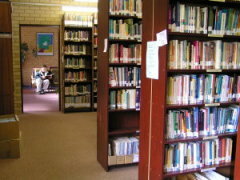 Perth Bible College boasts a well stocked library containing over 24 000 books, with that number continually increasing. Here students will find all the required material – and more! – for in-depth study and research on all topics covered in the syllabus. A wide range of periodicals (over 120) and online databases keep students abreast of all the latest theological developments, biblical research and creative concepts for communicating the gospel more effectively. The library also contains a large reference section which incorporates Bible commentaries, software resources, a variety of Bible versions, concordances, dictionaries, encyclopaedias, theological resources, maps and other study aids. The library catalogue is fully electronic, allowing students to not only search for resources from home, but also to access the College’s electronic journal collection. Pastors, Ministers, Full-time Ministry workers – Membership is available free of charge. Contact PBC today to apply for Library Membership. As part of Perth Bible College’s association with the Sydney College of Divinty, students have access to SCD libraries around Australia. More information about SCD libraries can be found in the SCD Libraries Brochure. PBC has a borrowing arrangement with Murdoch University where PBC students can borrow from the university library free of charge.